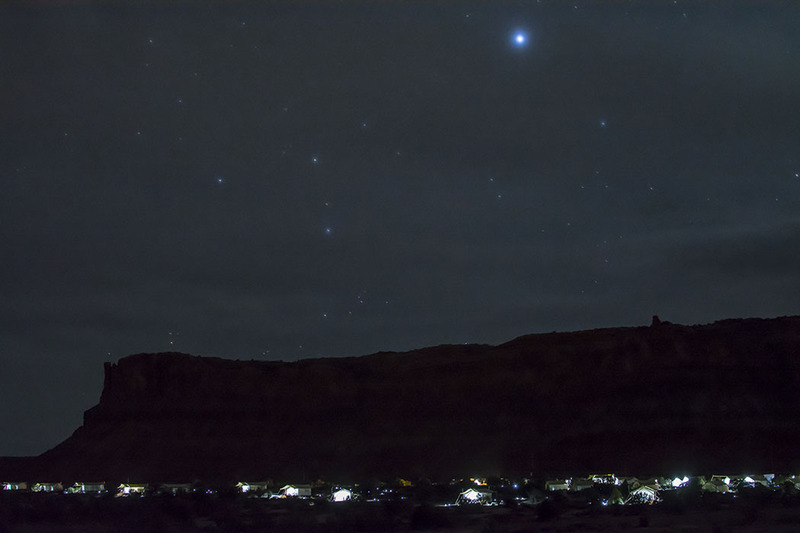 Imagine being one with nature, stargazing into the limitless expanse of the night sky, far away from the hustle and bustle of the big city life. Imagine exploring nature’s architecture, scintillating waterfalls and vertigo-inducing cliffs, and watching wildlife roam freely, as it always had. And now imagine that you can do all that without giving up the small luxuries and comforts that you are used to. 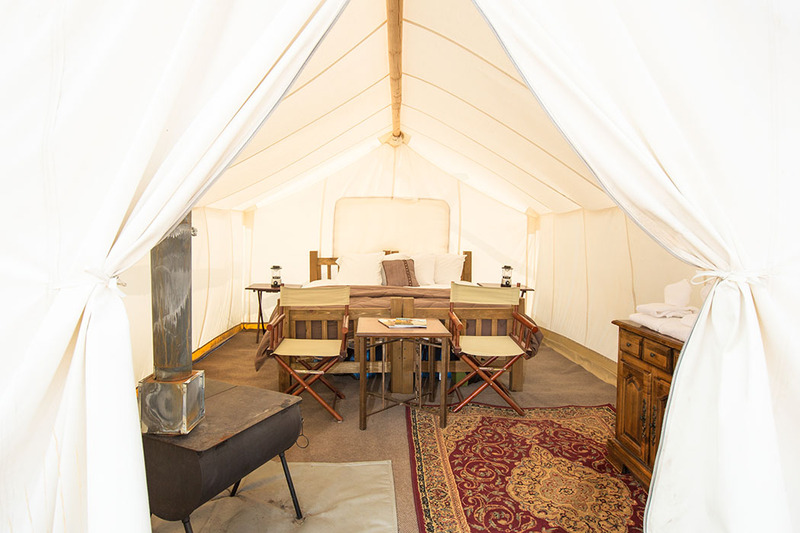 Introducing ‘glamping’ – the innovative, luxurious and comfortable way to explore camping. Under Canvas® gives you an opportunity to experience all the natural beauty of America’s most popular camping and backpacking destinations in settings so lavish, you will be wondering what took you so long to try this nomad-inspired lifestyle. The innovative concept goes beyond providing luxurious tents to sleep in. Under Canvas® gives you the chance to participate in organized activities, exploring each location’s unique points, be it Yellowstone Park, Moab in Utah or Glacier National Park in Montana. If active sports are not your cup of tea, Under Canvas® is also an excellent team building opportunity, an unusual wedding venue or just a great chance to catch up with friends and family. 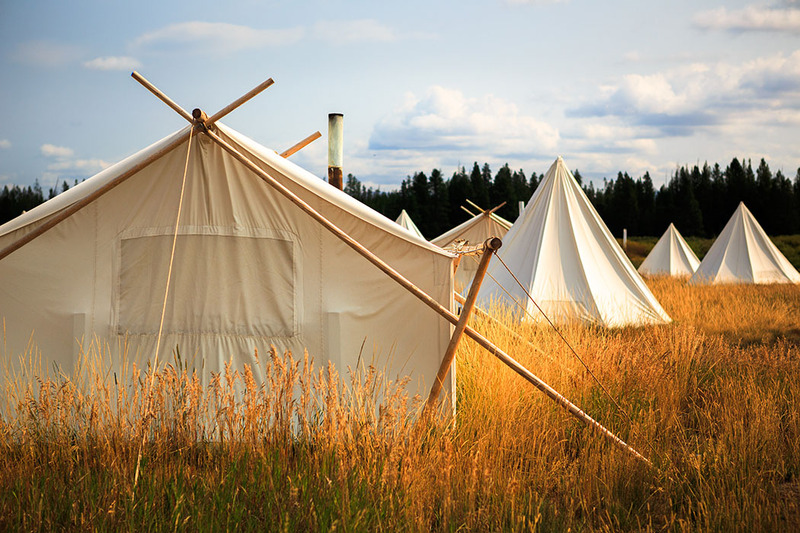 Under Canvas® Yellowstone offers a selection of accommodations, all a mere 15-minutes away from the West entrance of the world-renowned Yellowstone Park, with its kayaking, rafting, horseback riding and fly fishing opportunities. Have the most luxurious camping experience by booking a Suite, complete with a private en-suite modern bathroom, including a sink, flushing toilet and a roll-top bath, as well as a living room and a bedroom wing, with a King-size bed. Deluxe tents also benefit from private, adjacent bathrooms, as well as raised hardwood floors for your ultimate comfort. The Safari tents offer King-size and twin bed sleeping options, spectacular views and a full set of bedlinens, towels and toiletries. Although these tents do not benefit from their own private bathrooms, they are conveniently located in their proximity. Tepees provide comfortable lodging for larger groups, at a fraction of the price and still benefit from linens, blankets, furniture and sleeping bags. Tepees can sleep up to 4 guests and can also be a part of a ‘tent-and-tepee’ combo for larger families, where privacy and safety are combined in the best way for youngsters and their parents alike. Tip: Try to book a tent with a wood fire stove to keep nice and toasty on those chilly evenings and if you don’t fancy cooking, try the adjacent restaurant for some culinary delights. Glacier Under Canvas® is set in the picturesque Glacier National Park in Montana. The park boasts amazing golf courses, scenic drive opportunities, thrilling whitewater rafting routes and more. The team at Glacier Under Canvas® will be happy to organise any of the above and more, as you enjoy your stay. The camping site offers a variety of tents and tepees to suit every type of traveller. Those wishing to maintain maximum comfort can book a Suite with en-suite bathroom, separate living room and a bedroom with a proper king-size bed. 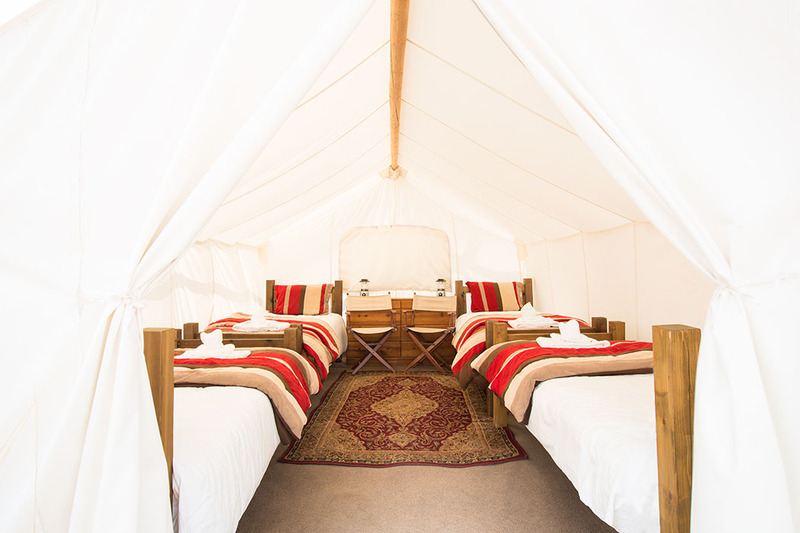 The Deluxe tent is only marginally less luxurious, as it still enjoys a secluded location, raised wooden floors and an en-suite bathroom with towels and spa toiletries. 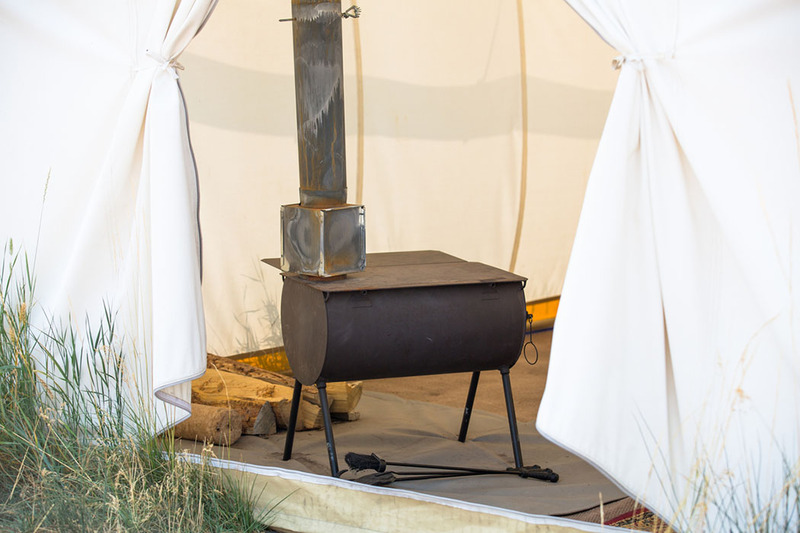 The Safari tent is a happy-medium between the tents and tepees and includes a wood-burning stove, as well as a fully furnished and spacious interior. The tepees provide furniture and towels, as well as all the camping necessities, such as sleeping bags. For those that want to explore nature but sleep better in a bona fide ‘house’, there are cabins on site, featuring kitchens and dining room, TV sets and DVD players, to name a few. These cabins sleep up to 6 people. For those that find tents and tepees mundane, the site also features treehouses, with all the amenities of a Deluxe tent, including a king-size bed. Moab Under Canvas® has all the tent and tepee options of the other two locations, all within a short distance from the entrance of not one, but two parks. Arches National Park is home to the famous Balanced Rock, La Sal Mountains and the Delicate Arch Overlook. Spend an afternoon admiring these natural rock formations, lit up by the warm setting sun. Otherwise, why not explore the Canyonlands National Park from a bird’s eye view, cruising over the breath-taking Colorado River, as it weaves its way through the largest of the five National Parks in Utah. Dubbed ‘the Mecca of mountain biking’, Utah’s red rock terrain holds a lot of appeal for every traveller. So if you always wondered about being one with nature but were apprehensive about the prospects of ‘roughing it’, Under Canvas® has solved this puzzle for you. So simply decide which one of their world-renowned natural reserves takes your fancy and accomplish that dream of sleeping under the stars in as much luxury as your heart desires.